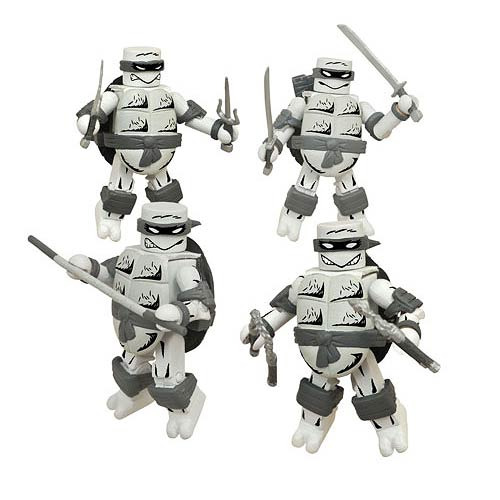 Go back to the Teenage Mutant Ninja Turtles comic-book roots with this 4-pack of Minimates that depicts the four Ninja Turtles in their classic comic book appearances - and in glorious black-and-white! Based on the Turtles' monochromatic debut in the original Mirage Comics issues that launched a worldwide phenomenon, this 4-pack includes Leonardo, Donatello, Michelangelo and Raphael, each with their signature weapons. Each 2-inch Minimates mini-figure stands 2-inches tall with 14 points of articulation, and features interchangeable parts and accessories. Packaged on a full-color blister card. Limited edition of only 3,000 pieces! Ages 10 and up. NOTE: This item will first be sold at San Diego Comic-Con 2015. If supplies remain after the show, your order will be filled.